Just do a search for it on uTube, its there. Not sure about the coverage he has but Ranger bass boats are like insuring Ferrari's. I have a '15 Ranger 620fs (multi species) and it runs me about 1200/year full replacement value and 10k in contents. Compare that to a 100k sports car? That will run north of 2K/yr. Excellent to deal with. Call them if you don't see what you need in their online catalogue and they'll try and find it. That's a good point. Baitcasters are many times more complex than spinning reels which means you have to spend a bit more to get something in the middle of the bell curve. Curado yes, Tatula yes... I have a Tatula type R that I just love and it works in all kinds of senarios (and looks better doing it than the shimano...lol). As previously mentioned, your application would help us with a recommendation. Also, as previously mentioned there's really no 'bad braid" out there. The only one I really didn't like was PP super slick as I found it would dig in on the spool which made casting problematic. Generally, I use plain old Power Pro Green (spectra) for everything from Bass to Muskie. Its the benchmark/industry standard braid and can usually be found on sale. Also, the mono backing idea is a great way to save a few $$. Another option is that you put on a full spool of braid and after a few seasons you run it off onto another reel so the unused portion is now on the outside of the spool. For mono backing, Berkley big game is an economic choice. you dont' lubricate the belt. Keep the shaft clean and spray it with a silicone lube from time to time. The Gen 1 issues were around the position sensors. If you ever end up needing repair, the only place to go in southern ont is Rocky's in Orillia. I had a very bad "Minn Kota" experience at Aikmans. I've owned several different MKs over the last 5 years so based on that, here are my comments: Don't limit yourself on features, you will grow into them. I would never buy a bow mount w/o a transducer for example. Although the Ulterra is pretty slick and safer to deploy, because you travel as far as Nip, I would go with a Terrova as they have fewer parts that can go bad. FYI, I have a gen 2 ulterra that took 3 trips to the repair depot last year to figure out an issue. As others have said, 24 volt is enough, 36 is better. Go 36 if you have a spot for 3 grp 31 batteries. If you don't, 24 it is. Also, get an on-board charger with an extra bank to charge your starting battery. I'll take the tackle bag if it's still availlable. I'm in whitby. Are you going to make your way into the gta in the near future? im going to be in Courtice on Thursday/Friday if you'd like to pick it up. text or call me at 905-242-9331. Plano 7771 w/o boxes. Includes spinner bait rack. Good condition and takes 4 standard plano 3700s. - $30 Cabelas Advanced Angler tackle bag (Magnum). Includes 5 3700 size storage boxes (holds 8 - $40) Down East clamp on rod holder and spike rod holder. $20 for the pair. 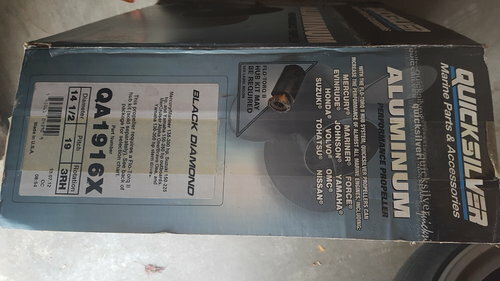 Quicksilver propeller - 14.5 x 19 new in box - $120. Open seat - Kawartha Muskie..
Didnt end up finding a victim to join me - after-all it was a Sunday with 1 days notice... I have my eyes on LSC now if only the damn wind would die down..